Last week, we had a very informative Roundtable on how to prevent identity theft. Sergeant Paul Rogers of the Palm Beach Gardens Police Department was our guest speaker and provided the group with valuable information such as using a cross-cut shredder instead of a strip-cut shredder at home. Just as technology progresses, so do the criminals. Sergeant Rogers stated "there are a lot of scams out there and the community needs to be vigilant about protecting their information"
Sergeant Rogers also talked about phone scams targeted to the elderly and gave good advice. Some of you may have heard of the "Grandma phone scam" - this is when an elderly person gets a phone call from someone that says they are your grandson and says they are in another country and needs money right away. Sergeant Rogers says "the best way to handle this is to act as if you have a bad connection, hang up the phone and call your grandson or their parent and find out what is going on." Identity thieves are getting more creative each day. Sergeant Rogers also said you should be very careful about what you share on the Internet and Social Media - do not put your date of birth on any social media sites. Sometimes this is all a criminal needs to obtain your identity. 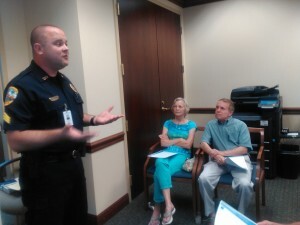 Sergeant Rogers gave handouts from the Federal Trade Commission on Avoiding Identity Theft, Phone Scams and What To Do If Your Identity is Stolen. If someone is using your personal information to open accounts, file taxes, or make purchases, visit IdentityTheft.gov, the federal government’s one-stop resource to help you report and recover from identity theft. Click here to watch a short video. Everyone should watch this and when it's over, don't forget it. If you have a group that would like to learn more about identity theft, contact your local Police Department and ask for someone to speak to your group.